Wondermondo has listed the tree species by the height of the tallest existing specimens. We start with No.10 and end with the tallest tree on Earth – No.1.! Noble firs are beautiful, impressive trees – the largest firs. The highest tree of this species grows at the Goat Marsh – in 1989 it was 89.9 m tall. Unfortunately this tree is dead by now and maybe even is not standing anymore. Tallest known tree of this species was 99 m tall. Unfortunately it was destroyed in eruption of Mount St. Helens in 1980. Tasmanian blue gum is popular plantation tree because it is well suited for Mediterranean climate and also tropics. This tree grows fast and serves as a good material for pulp and eucalyptus oil. Current record holder is lower than the tallest known trees of this species – there have existed up to 101 m tall Tasmanian blue gums. Current tallest tree of this species was discovered in the 1970ies. Manna gum is common, for most part comparatively small tree. It came as a surprise when in the 1970ies loggers discovered nearly 90 m tall trees of this species in the northeast part of Tasmania. To protect them in 1977 state created Evercreech Forest Reserve. Now the tree has exceeded 90 m height. Giant sequoias by far are the largest trees in the world by wood volume. But they belong also to the tallest trees in the world reaching well over the height of 90 m. Some giant sequoias in earlier times reached the height of 97.8 m.
Current tallest tree was discovered and measured in 2013. It grows in Converse Basin and does not have any specific name. Researchers do not provide exact location of the tree. Few know that one of the tallest trees in the world is located in Philippines. This Philippine Rosewood – or, as locals call it – toog tree is towering tall in the sky in the outskirts of San Francisco town. In autumn 2010 the people of Alegria decided to organize an extravagant event – to have the highest Christmas tree in Philippines and most likely – in the whole world. In order to record this achievement tree-climbers made an exact measurement. The measured height of the tree was 96.9 m. It is though possible that the decoration on the top of the tree was included and the tree is somewhat lower. Wondermondo has no information about earlier taller trees of this species and it is clear that there is a need to research other Philippine rosewoods to determine their maximum height. See images of this tree in the galleries of Jojie Alcantara! Current tallest tree was discovered in 2001, last known measurement was made in 2007. Exact location of this enormous tree is not disclosed – Wondermondo knows only that the tree is located in Prairie Creek Redwoods State Park. State established this park in the 1920ies in order to protect redwood forest with extremely tall and large trees whose growth is facilitated by the very frequent fogs. Tree has a lively top, it seems to be growing and might be taller by now. 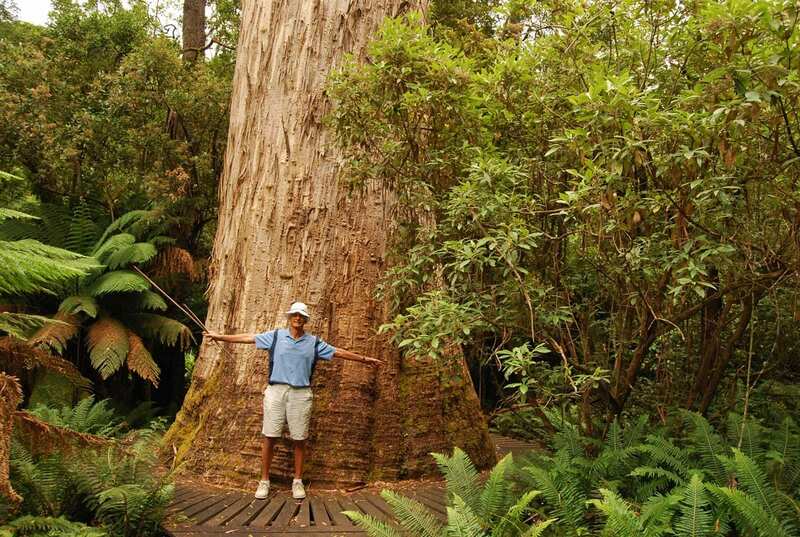 Current tallest tree was discovered in 1989, last measurement known to Wondermondo – in 2011. In 1897 there was cut reportedly 142 m tall fir in Loup’s Ranch, Washington state. Reliable historical record holder is the 119.8 m tall Mineral Tree with a diameter of 4.6 m. It is highly possible that coast Douglas firs in recent past were the tallest trees in the world. Current tallest tree of this species was discovered in August 2008. It is lucky coincidence that Centurion has survived. Wildfires in 1934 spared just a few older trees in this area and passed on west side. In 1950 loggers worked nearby and at that time this giant tree would not be spared. In 1966 and 1967 the forest close nearby was deliberately burned for later regeneration, in 1967 this turned into furious, devastating fires. This time fire passed the tree on east side. This tree has good hopes to exceed the height of 100 meters. Tree climbers have reported that crown is healthy and is respouting from broken top, thus some time ago Centurion was some 103 meters high. Thus it is the most likely candidate for historically tallest known tree with reliable measurement results. 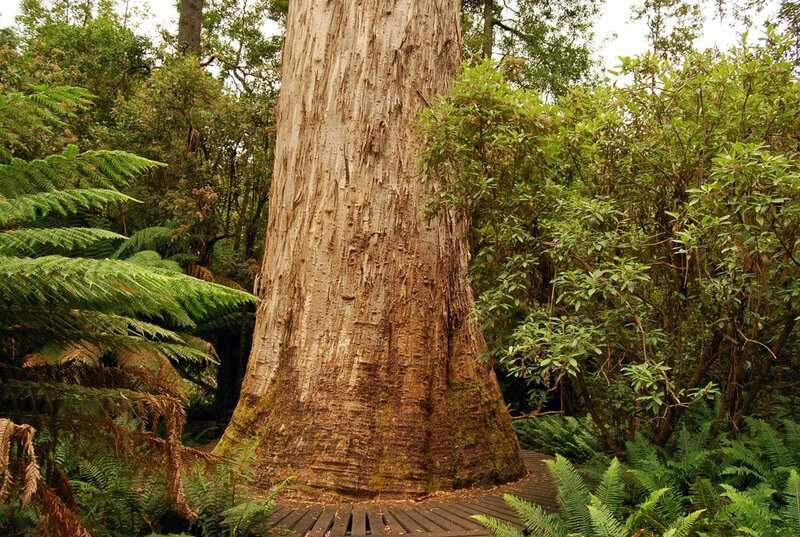 See image of this tree in the Website of Dean Nicolle and Tasmania’s Giant Trees website! This tree was discovered and measured in January 2019 and is named Menara – “tower” in Malayan. Next to it are other trees of similar height. Menara is the world’s tallest known flowering plant and tallest tropical tree – but there still are chances to find a taller one. Current tallest publicly announced tree was discovered in 2006, latest measurement was made in the 2015. There are no doubts that coast redwood is the tallest tree species in the world. This might be lucky (for coast redwood) coincidence – in the recent past there were coast Douglas firs (in United States and Canada) and eucalyptus (in Australia) of comparable height and possibly higher, but these trees were ruthlessly cut. Nowadays there are known many hundreds of coast redwoods exceeding the height of 100 m… and no trees of other species exceeding this height. Currently there are known taller coast redwoods, nearly 119 m tall but these trees are not publicly announced. Tallest and largest known tree was Lindsey Creek tree (Fieldbrook, California) which was uprooted by a storm in 1905. This tree was 118.9 m tall, diameter could reach 11.6 m.
See images of Hyperion at L’Antic Colonial! Jean-Christophe Domec, Barbara Lachenbruch, Frederick C. Meinzer, David R. Woodruff, Jeffrey M. Warren, and Katherine A. McCulloh, Maximum height in a conifer is associated with conflicting requirements for xylem design, Proceedings of the National Academy of Sciences of the United States of America. August 11, 2008. Accessed 18.12.10. Elizabeth Pennisi, The Sky Is Not the Limit, Science. December 23, 2005. Accessed 18.12.10. George W. Koch, Stephen C. Sillett, Gregory M. Jennings & Stephen D. Davis, The limits to tree height. Nature. April 22, 2004. Accessed 19.12.10. If "lost", refresh the page to see all 10 locations! All these monuments belong to the category of Trees. Highest concentration of the tallest trees in the world is in western coast of United States (5 species) and Tasmania (3 species). Current list is an attempt to list 10 tallest known species of trees in the world. Wondermondo though believes: if people would know everything about Earth, this list would look different, with more species of trees from the tropics. What are the limits of the height of trees? Over the last years scientists of the world have published rather many research papers about the limits of maximum tree height. The limiting factor most likely is the ability of a tree to pump the sap up to the top. Peripheral branches of trees often are suffering from xylem embolism when the air is blocking the vessels. Research shows that due to this factor the maximum possible height of the tree is between 109 – 138 m (1). At big height, the walls of sap vessels become thicker and ducts – more narrow until they are too narrow to let through the water. Further research shows that conifers, in general, have somewhat larger pores between water-conducting cells than hardwood. Due to this conifers tend to be taller than hardwood trees. Most likely this is not the only reason limiting the height of trees – in very wet climate tops of the trees might get the water directly from the precipitation – but they still do not grow higher. Currently the tallest trees in the world are coast redwoods (Sequoia sempervirens (D. Don) Endl.) in United States, California. Officially the tallest tree of this species is 115.61 m high but there are credible statements about taller trees. Trees – description and map of world’s most impressive and interesting trees. Largest trees of the world – unique list of world’s largest trees (by circumference). Circumference of trees in this list exceeds 14 m and currently there are listed more than 50 species! World’s tallest trees – unique list of world’s tallest trees (by species). Height of these trees exceeds 80 m and currently it includes more than 30 species. Top 10 largest trees of the world – 10 largest species of trees of the world by circumference, with a map. Eucalypts are a familiar part of Australia’s natural landscape and an integral part of the Australian identity. They have been farmed and used to build houses, furniture, roads, and bridges since the beginning of white settlement. Australians and international visitors alike have been inspired by them, painted them, made films about them, written books about them, and of course Aboriginal Australians have long made musical instruments from them. Hidden away in foggy, uncharted rain forest valleys in Northern California are the largest and tallest organisms the world has ever sustained–the coast redwood trees, Sequoia sempervirens. Ninety-six percent of the ancient redwood forest have been destroyed by logging, but the untouched fragments that remain are among the great wonders of nature. The biggest redwoods have trunks up to thirty feet wide and can rise more than thirty-five stories above the ground, forming cathedral-like structures in the air.